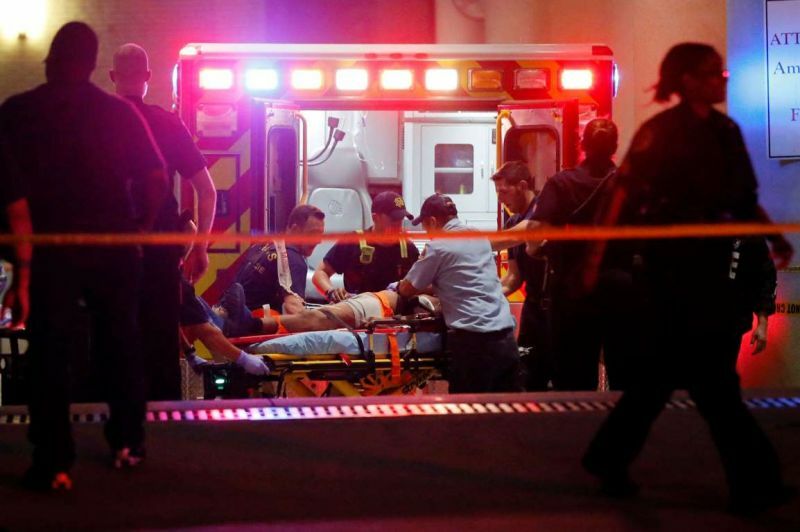 TEXAS, USA - The city of Dallas was plunged into chaos overnight as five police officers were shot dead and at least six others were wounded when dozens of shots were fired during a downtown protest against violence. It was the deadliest day for US law enforcement since 9/11. There was a lengthy standoff between police officers and one man suspected to be one of the shooters, before, according to numerous local reports, he was shot dead. It was unclear whether the suspect was shot by police or killed himself. The Guardian was unable to confirm the reports. Three other suspects were in custody. The Dallas police chief, David Brown, said he did not have a “complete comfort level” that all suspects had been apprehended. The suspect involved in the standoff had warned that bombs had been planted across the city and a “suspicious package” was also found near his location. The FBI is among authorities investigating the bomb threat. Officers exchanged gunfire with the trapped shooter into the early hours of Friday, Brown said, telling reporters the suspected gunman had told officers “the end is coming” and that “he’s going to hurt and kill more of us – meaning law enforcement”. One of the officers killed was named as Brent Thompson, a Dallas Area Rapid Transit (Dart) officer, aged 43. Dart said he was the first of their officers to have been killed in the line of duty. The anti-violence rally descended into chaos after what Brown described as “two snipers” shot at officers “from elevated positions”. Four officers were initially reported shot dead and several of the wounded were said to be in surgery or a critical condition. One later died, according to the Dallas police officers’ association. Brown said the FBI and ATF (Bureau of Alcohol, Tobacco, Firearms and Explosives) had been asked to assist in investigating the bomb threat. The Federal Aviation Authority (FAA) later issued a temporary flight restriction over downtown Dallas. The police chief said two suspects were apprehended after officers followed their vehicle and recovered two camouflage bags. Another suspect, a female, was arrested close to the garage where the standoff was taking place. The department was investigating whether any of the suspects had prior knowledge of the protest’s planning. “We’re leaving every motive on the table,” Brown said. Dart announced on Twitter that four of its police officers had been struck, one fatally. The injuries to the other three officers were described as “not life-threatening”. Speaking alongside the police chief at the press conference, the Dallas mayor, Mike Rawlings, described the shootings as “our worst nightmare”. The Texas governor, Greg Abbott, said in a statement that his “thoughts and prayers” were with the families of those officers who had been shot. Protests had taken place around the US earlier on Thursday evening after the fatal police shootings of two African American men, Alton Sterling in Baton Rouge on Tuesday and Philando Castile on Wednesday in Minneapolis. As large protests grew in cities including New York and Minneapolis, a similar demonstration in Dallas appeared to be proceeding peacefully and in good spirits. Police estimated that about 800 protesters and 100 officers were present. At 7.12pm local time, officers were posing for photographs with demonstrators. However, police and witnesses said that at 8:58pm shots rang out. Video footage captured by local television cameras and witnesses on social media showed at least one officer on the ground. Protesters were seen fleeing through the streets of downtown Dallas screaming as multiple shots rang out in quick succession. Graphic video appeared to show one gunman exchanging fire with a man who appeared to be a police officer. The gunman appears to hide behind a pillar outside a building and jump out behind the officer, gunning him down. Dart suspended all downtown bus and rail service. Streets appeared to have been cleared by officers while they searched for suspects. The deaths of the officers were the first fatal shootings of police at demonstrations since unrest spread across the US after police shot dead of an unarmed black 18-year-old in Ferguson, Missouri, in August 2014. Two officers were wounded by gunfire while guarding the Ferguson police headquarters during a protest in March last year. A 20-year-old man was charged with crimes including first-degree assault and has pleaded not guilty. In December 2014, two New York police officers were killed in an ambush-style attack by Ismaaiyl Brinsley, who then killed himself. Before the shooting, Brinsley, who had mental health problems, had mentioned on social media high-profile cases of black men being killed by police. This hatred needs to stop were all just as ugly. But that hatred is impossible to reverse now. It was mostly one-way, now it is clearly two-way. It looks like MLK's dream of peaceful resistance died last week. ISIS now has a perfect source inside America for recruits. This story is just sad. In the midst of it all, the media has already forgotten about the young black guy who was senselessly killed by a white cop. It is amazing to see how happy they were to shift their focus from the black victim to the 'black killer'. What happened to the white police officers was heart wrenching but what is happening to America as a result of racism in the police force is atrocious. Imagine, black people having to fight for justice in such a way just to be accepted as human beings.......... I hope that their leaders now recognize the need to address the problem as it should never have gotten as far as it did. It is written that the table shall turn.